A 3D Touch table in action. 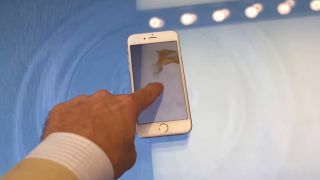 Apple's very keen to promote the new 3D Touch technology inside this year's iPhones, so much so that the company has installed pressure-sensitive tables inside two of its flagship stores in the US. If you live in San Francisco or New York then you might want to head down and give them a try: the surfaces of the display units start to ripple when you press down on the iPhones sat on top of them. According to an Apple Store employee who spoke to Grate App, there are only two of these tables in existence - so chances are you won't be able to play around with them at your local overcrowded shopping centre. Apple hasn't said anything publicly about these new tables, but the tech giant has a long track record of experimenting with the layout and features of its high street stores in order that they might best show off the Cupertino company's wares. 3D Touch may seem gimmicky for now, but it looks like Apple is committed to the technology. It's only officially supported on the iPhone 6S and the iPhone 6S Plus, but you can get something similar on older models if you're prepared to jailbreak your phone. Meanwhile, Android manufacturers are waiting in the wings with a 3D Touch-type technology of their own. Soon these pressure-sensitive screens might be as ubiquitous as smartphone cameras - although 3D Touch tables are unlikely to become quite as popular.